Any plans for the May Bank Holiday? Do you love your town? How about combining a fun physical activity with raising awareness of issues in the local community? This May Day your small strides could mean a giant leap for your community. 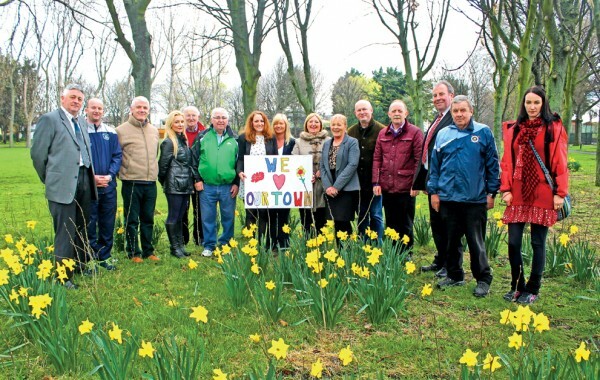 A community fun run has been arranged for Monday May 5th as part of the Our Town initiative, a collaboration between architect Felim Dunne and garden designer Diarmuid Gavin of RTÉ’s Dirty Old Towns. The aim of Our Town is to help communities regenerate themselves from within by restoring the sense of pride and loyalty that is such a strong part of Irish life and culture. “The Our Town Ringsend/Irishtown initiative will seek to establish from the local residents, community groups and businesses of Ringsend and Irishtown a sense of what they feel would help their community become a better place. Together we will develop a single, sustainable vision to enhance the community over the next five years and we will then source the funding and harness the manpower to implement that vision. “Our Town provides a Corporate Social Responsibility (CSR) service to the corporate sector, whereby Our Town will develop CSR projects specific to each corporate entity. The corporate partner will provide volunteers and funding. It is an opportunity for the corporate partner to engage meaningfully with the community in which it operates,” Dunne tells NewsFour. Gavin and Dunne have chosen Ringsend/Irishtown as the pilot for the project, which is currently in its “Community Awakening” phase. A series of meetings with Gavin, Dunne and members of the community led to the formation of a sub-committee charged with the task of organising the fun run. The fun run is seen as an ideal way of getting the Our Town message out to the Ringsend and Irishtown community, while also providing a fun day out for all the family. The FREE 5km run will take place in Ringsend Park, consisting of four laps. There will be a medal for the 1st man and 1st woman to cross the finish line and medals will be given to the next 10 people who finish. Those wishing to take part are urged to register online at www.ourtownfunrun.com. This will avoid queuing on the day at the registration desk in Irishtown Stadium which opens at 11.30am. The starting pistol will fire at 12.30pm sharp. Everyone who visits the area or who lives or works in Ringsend/Irishtown is encouraged to take part, regardless of age or ability. Some groups may wish to use their participation to raise funds for a cause through self-organised sponsorship. Those wishing to walk are encouraged to join the RICC May Day Parade. The parade will start on Thorncastle Street at the Ringsend and Irishtown Community Centre at 2pm and march through Irishtown, down the Sean Moore Road, Pigeon House Road, Cambridge Road and back to the centre. This will be the sixth annual RICC May Day Parade which proves to be a very popular event every year. “The purpose of the parade is to celebrate growth and development in the community and to showcase the many wonderful groups and organisations in our area,” RICC Manager Lorraine Barry tells NewsFour. A barbeque with light refreshments will be held at the rear of the centre, with entertainment provided by local talent including singing, Irish dancing, clowns and magicians, face painting and lots more. This community day is just the start of Our Town’s journey. With your help we can take our community across the finish line. Pictured is a small selection of the many groups involved in the Our Town Ringsend/Irishtown project. From left to right: John Dodd (Clanna Gael), Jonathon Tormey (FAI), Joe Donnelly (Fair Play Café), Theresa Weafer (RDRD), Larry Ryder (Crusaders), Boy Murphy (Bridge Utd), Karen Keegan (NewsFour), Barbara Doyle (RICC), Mary Ward (GALS), Mary Doolan (RCSF), Felim Dunne (Our Town), Shay Connolly (Clanna Gael), Michael Kelly (O’Dwyer’s Auctioneers), Gerry Brannock (Stella Maris Rowing Club), Sueann Moore (RCSF). With special thanks to the One Directioners; Casey Murphy, Jessie Hughes, Karen O’Connell, Caitlin Whelan and Mary Spencer of the Ringsend and Irishtown Youth Project who made the lovely sign.